Motorola heavy duty Remote Speaker Mic. 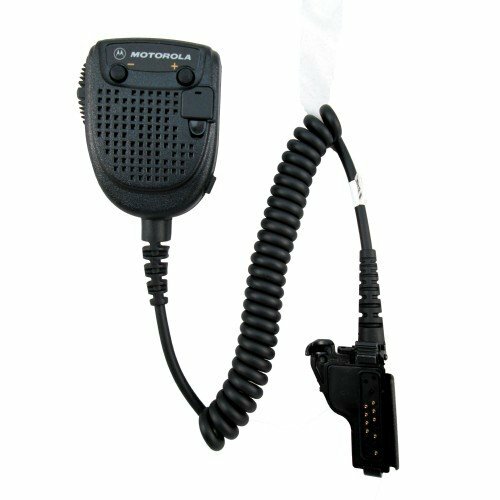 This Motorola RMN5038A is a Motorola Original RMN5038A Remote Speaker Mic. The RMN5038A Remote Speaker Mic Features Orange Emergency Down Button, High/Low Volume Control, 3.5mm Accessory Port, Coiled Cable, (PTT), Swivel Clip. Compatible Models PR1500 MT1500 MT2000 MTS2000 HT1000 MTX XTS2500 XTS5000, XTS3000 and XTS3500. If you don't see your specific model number please call and confirm to see you if your item is compatible. MODEL NUMBER RMN5038A Injuries and life-threatening emergencies can strike at any time, causing a "man down" situation. That's why everyone benefits when each team member has the essential protection of this emergency button-equipped remote speaker microphone. When a member of the team goes down, the orange button on the RSM can be used to signal that the operator needs help. You must have a compatible program set up for these mic's to work. Water-resistant design meets MIL Standard, 40mph blowing-driving rain rated. Radio programming is required for the RSM units emergency button to operate properly.